Simple Sampler Quilt-Along. My first go at quilting. Last September I noticed that The Sewing Directory were advertising what looked like a really fun challenge to learn how to make a quilt using sampler blocks. It was mainly aimed at people who had never quilted before and wanted to learn how to using weekly step by step tutorials. This appealed to me straight away. 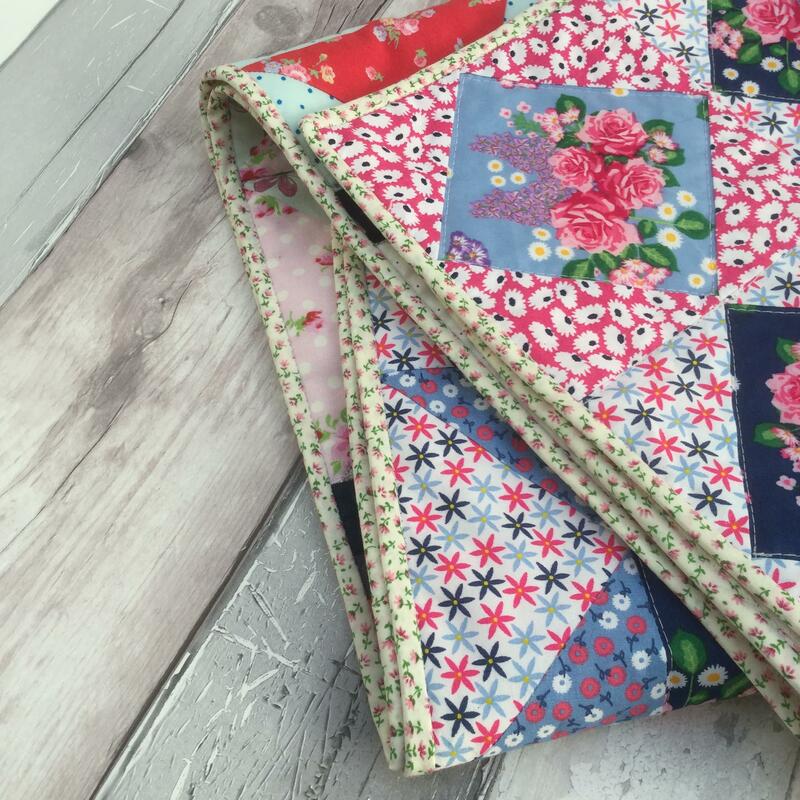 I have never tried quilting before but really admired some of the designs I had seen online, it was also a good way of using up some of the mountain of fabric scraps that were accumulating in my sewing room! The course of weekly tutorials would run from October through to February with a little break during Christmas. Perfect. Organised through The Sewing Directory, with brilliant instructions from expert quilter Kerry Green from Very Kerry Berry Blogspot, it was a super fun gentle introduction into quilting. Starting of course with very simple blocks, and progressing quite smoothly to more challenging designs, each week you would go ahead and make either one or two blocks. The end result would be a lovely lap quilt made with twelve blocks, or larger if you chose to make up more of the blocks. Straight away I was rummaging through my scrap fabric stash to see what colours I had. I seemed to have mostly reds, pinks and blues, so these were my colour choices. One of the best things to take from this experience was the pure joy at seeing the work produced by the other people taking part. Each individual has their own style, and colour preference and some of the fabric choices were stunning. You may like to have a little look yourselves – head on over to Instagram and search for #simplesamplerqal you will not be disappointed! I won’t fill the rest of this post with all 12 individual block that I made – feel free to head over to my Instagram account if you would like to scroll back and see them all, but I will show you below some of my favourites. All too soon, the blocks were all made and it was time to bring them together to form the quilt. I did wonder how difficult this would be, but as in previous weeks the instructions were super easy to follow and before I knew it I had sailed through sashing, borders, basting, quilting and binding. I would like to mention what wonderful support and encouragement was provided by The Sewing Directory and Kerry Green. Weekly posts on social media by the entrants were greeted with wonderful positive comments from all, and I have to say I value all my new quilting friends that I have made through this lovely challenge. Each month prizes were given and I am chuffed to say that I won a very generous £20 voucher to spend at Fabric HQ during December. Although I spent hours (literally) going back and forth through their pretty fabric selection (so much choice – I wanted it all)! I eventually opted to spend my voucher on a much wanted sewing pattern and a couple of sewing tools. The top that I made with that pattern is on my blog here, and the sewing tools I chose have been so useful and greatly loved. So during February I finished my lap quilt. I am pretty pleased with how it turned out. I definitely need more practice with my quilting skills as straight line quilting was all I felt I was able to do. I think it’s not bad for a first attempt. Maybe if I had realised how much I was going to love this I would have chosen my fabrics more carefully. Whilst I am glad I have used up a lot of my scrap fabrics I think I may have had a better looking quilt if I had splashed out on some pretty coordinating quilting cottons. 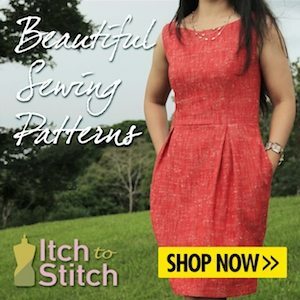 At the time of writing this the instructions for the whole challenge can still be found on The Sewing Directory’s website here. I would encourage you to take a look and have a little go! I understand (fingers crossed), that there may be another quilting challenge in the future so if you are interested in a really sociable fun quilt-along you may want to follow The Sewing Directory on social media so that you can be the first to hear! My finished quilt. I love it! Thanks again to all involved to introducing me to such a rewarding and relaxing side of sewing. I will definitely quilt some more in the future, and in the meantime will continue to admire and be inspired by all my new quilting friends that were made during this challenge. Did you take part in this challenge? I would love to hear your thoughts.